Well the weather is getting warmer so it’s time to break out some brights for summer! Yesterday on Twitter, the trending topic #childhoodmemories really reminded me about all of fun and simple things that made me happy as a child. Now I’m not a huge fan of candy but I have a few favorites and one is Peach Rings. Who remembers these?! Better yet, who still eats these?! I haven’t had Peach Rings in years but they still taste the same all these years later. 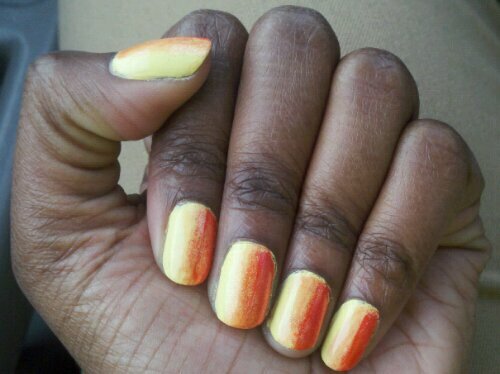 For this mani, I applied a base coat then 2 coats of Orly Lemonade. Next, I applied a very sheer coat of Wet n’ Wild Fast Dry 9.0.2.1.Orange then waited until it was dry to sponge a bit more orange on about 2/3 of each nail. After that, I applied a sheer coat of China Glaze Cherry Pie on 1/3 of my nail over the 9.0.2.1.Orange and sponged more on that third once was dry. Lastly, I applied a top coat and Voila! 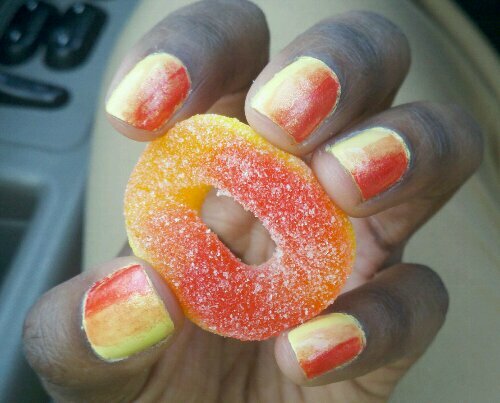 A Peach Rings-inspired nail art design! This manicure looks sooooo pretty in the sun, folks. I hope you enjoy! It’s the clllaaaawwww! With a Peach Ring!! 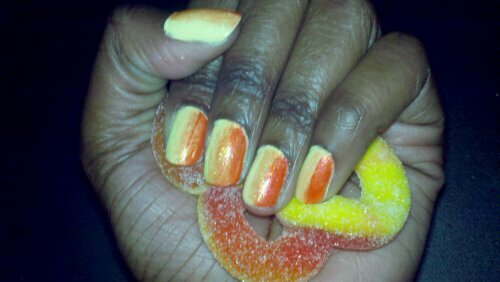 Posted on May 11, 2011, in Inspired by... and tagged Brights, China Glaze, China Glaze Cherry Pie, manicure, nail art, nail polish, Orly, Orly Lemonade, Peach Rings, Summer, Summer Nail Color, Summer Nail Trend, Wet n Wild, Wet n Wild 9.0.2.1.Orange. Bookmark the permalink. 7 Comments. I would love to see this with glitter on top to mimic the sour sugar they’re glazed in. Oooh la la! A request! Let me see what I can do! 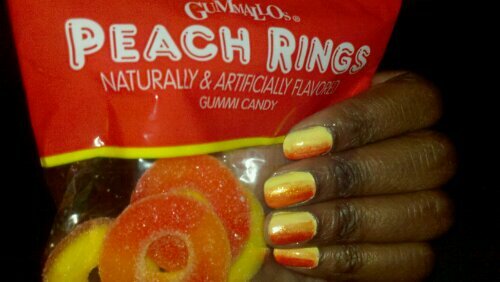 Really nice…Its funny you find inspiration for our nails from the simplest things…Peach rings: how cute…. Thanks so much. That means a lot coming from professionals like yourself.